I've had a lot of fun recently making cards using the old Star Co. NBA design. 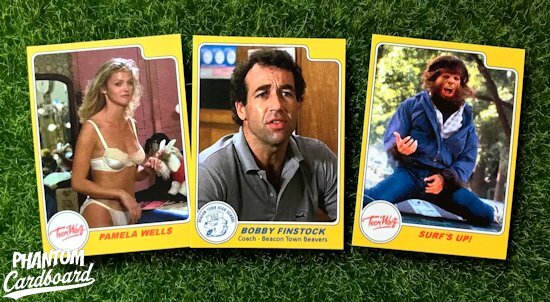 For the non-trading card geeks out there, Topps stopped producing NBA cards after the 1981-82 season. This left a basketball card void seeing as how Topps was the only brand making cards for the NBA. Star Co. stepped in producing NBA cards starting in 1983. 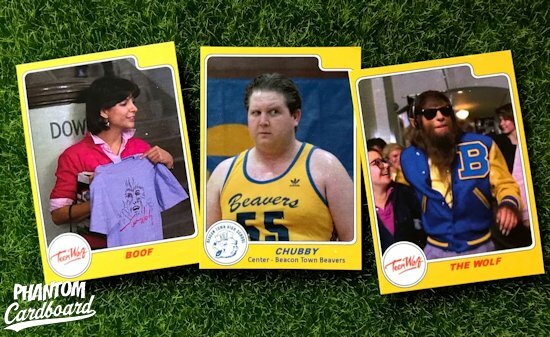 Star cards were made in much more limited quantities than the other traditional major sports card brands. They also took a different distribution route. They were sold in clear poly bags by team or subset instead of in boxes of wax packs. They were available mainly through independent dealers, some hobby shops and sports stadiums. They were produced from 1983 through the 1985-86 season when Fleer obtained the license to produce NBA cards. 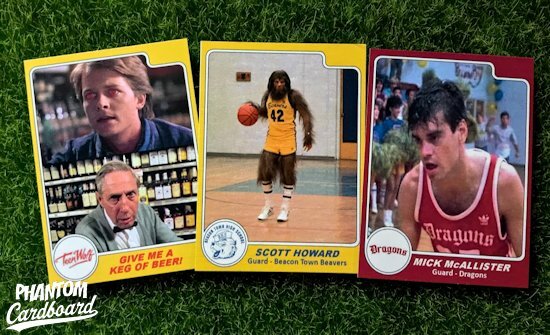 If you think of some of the all-time greats that entered the league in that span of years I bet Topps wishes they had a mulligan on the decision to discontinue their NBA product. As a kid I loved baseball first as a fan/collector, but my love soon shifted to playing and collecting basketball. It helped that the time frame coincided with the Detroit Pistons' steady rise to eventual championship glory. As far as collecting goes, Star Co. cards for me had been a unicorn. I heard about them and occasionally seen them in Beckett magazine, but never owned any or knew anyone who did. That changed in 1993 -around this time of the year in fact- when I went into a local card shop and right there in the display case was both the Isiah Thomas 1984 All-Star checklist and his regular AS card. My mom had given me a $20 to buy a single pack of the Classic NCAA basketball cards (I was hoping to get a Chris Webber U of M card). She was expecting a lot of change back. The Isiah Thomas cards were marked at $10 each. I literally panicked. I mean, what if someone else got them while I waited to save up enough allowance? When would I ever see any again?? I had to have them, and the guy behind the counter even let me slide on the sales tax! My mom, who was waiting in the car, was pissed. I knew she would be. But, what was I supposed to do? Through heavy panicked breaths I tried to explain the gravity my predicament, but she just didn't get it. Thankfully she saw how much they meant to me and didn't make me take them back in. I just got the silent treatment for a couple of days and I didn't complain about anything my mom asked me to do around the house. That to her was probably worth it because I never wanted to do the dishes and stuff like that. If you're familiar with the Star Co. you know that the design didn't change, they just switched up the color from one year to the next. For me that adds a great deal of versatility in being able to use one design for anything from 1983 to 1986. And I've used them quite a few times since creating the template. I just love them. The design to me is unmistakably vintage. 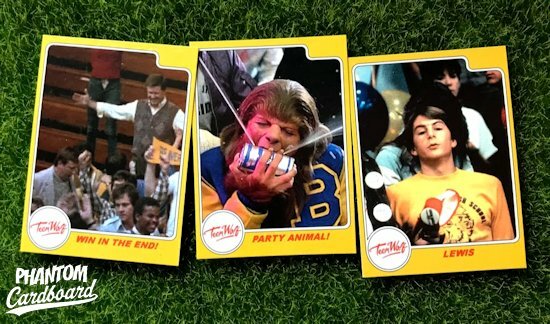 With these Teen Wolf cards I started with a Michael J. Fox basketball card. Then I wanted to make a Chubby card and from there a fifteen card mini-set just snowballed. I got lucky that I was able to find decent images to get all the scenes I wanted to have as part of this mini-set. Small confession, I'm indifferent at best about Michael J. Fox. I just find his characters always to be a little too high pitched and overly dramatic. But, I recognize him as an absolute '80s icon. I love Teen Wolf. 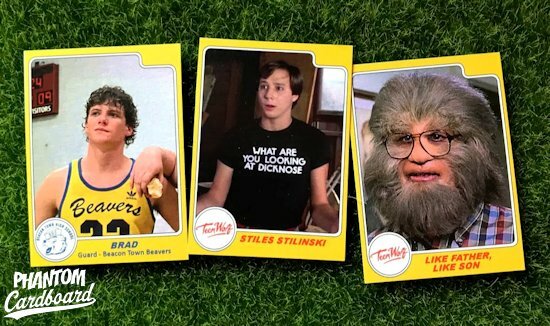 It's got a Werewolf, basketball, and a shirt with the phrase "dicknose" on it. What's not to love? So, it bums me out to know the MJF didn't think too much of the role, so little in fact that he declined the sequel. That does nothing to endear Mr. Alex P. Keaton to me, but I digress. I hope you the reader enjoy these custom cards as much as I did in creating them.